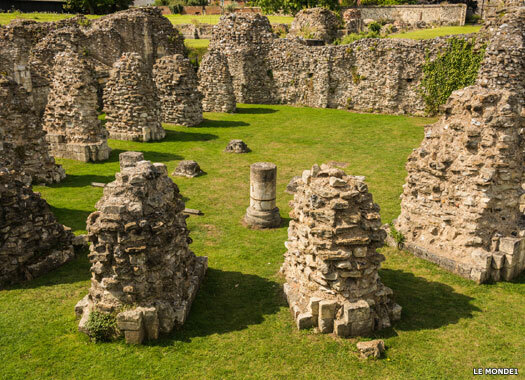 The ruins of St Augustine's Abbey lie south-east of the city, between it and St Martin's Church. 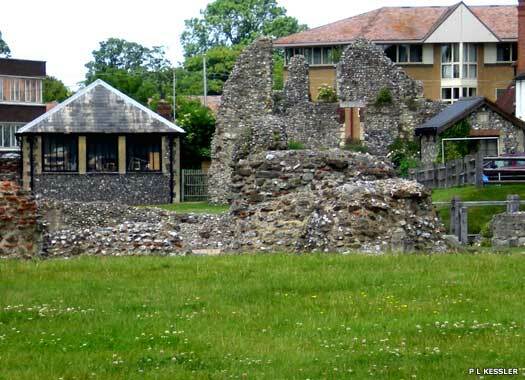 St Augustine landed in Kent in AD 597 to introduce Christianity to the pagan Angles, Saxons and Jutes after their conquest of the south and east of Britain. Unfortunately, this had also had the effect of destroying the remnants of the Roman British Church. 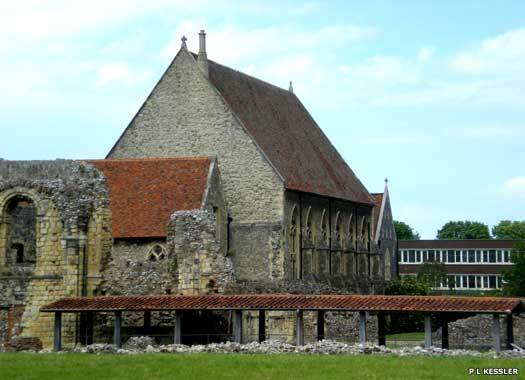 In 598 work started on the abbey to house St Augustine and his monks while they worshipped at St Martin's. 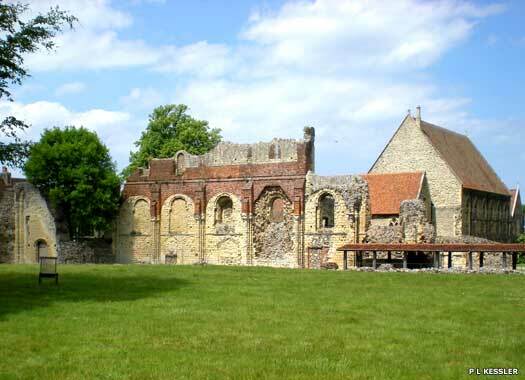 The abbey also became the burial place of the kings of Kent and archbishops of Canterbury. 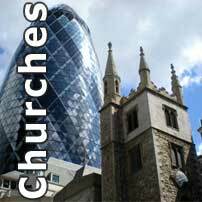 Three separate chapels were built; the Church of St Peter & St Paul, the Church of St Mary, and the Chapel of St Pancras (here), but only parts of St Pancras have survived. 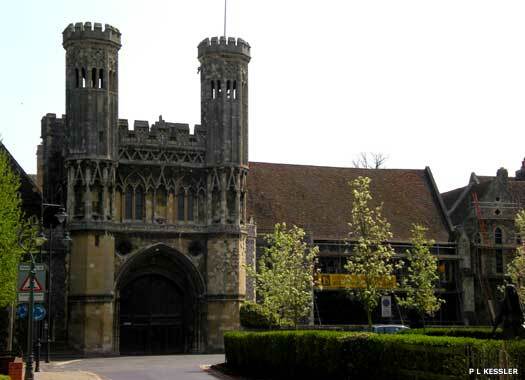 Canterbury also became a centre of teaching, and subsequently the scriptorium flourished, producing elegantly illustrated books, although ninth century Viking attacks on Canterbury may have reduced output. A monastic revival swept England during the middle of the tenth century under the reforming influence of St Dunstan, archbishop of Canterbury (960-988). In 978, the west wall of St Peter & St Paul was demolished and the church was enlarged and additionally rededicated to St Augustine, which is when the abbey as a whole became known as St Augustine's. Further enlargements followed in 1047-1059, but they remained unfinished after the death of Abbot Wulfric II. 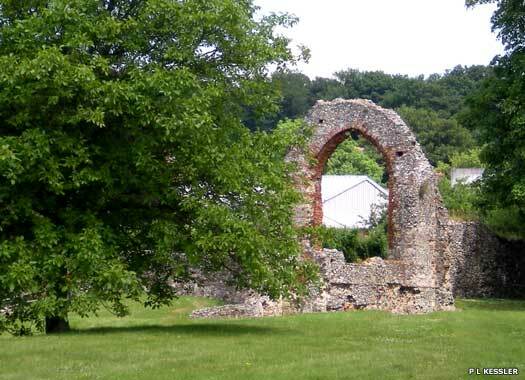 Appointed by William the Conqueror, Abbot Scolland replaced the old Saxon stonework with a new, Romanesque structure, much of which is still visible in the ruins. Fire damaged the church in 1168 and repairs and enhancements were undertaken during the thirteenth century, with a bell tower being added after the earthquake of 1382. The Dissolution meant that St Augustine's was surrendered to Henry VIII in 1538 and its treasures and relics were lost. Henry kept St Augustine's for himself rather than sell it off as he did most of the other monasteries. He converted it into a royal palace in 1539, altering buildings from the prior's lodgings into a residence fit for the reception of his latest wife, Anne of Cleves. The brick top of the north wall (shown here) dates to this period. In 1541, Henry ordered the demolition of the church. The materials were used in other projects, such as Walmer Castle, and after his death the palace was leased. The grounds were converted into formal gardens in the 1600s, although the fourteenth century Great Gate (above) survived and now leads to part of the King's School. The palace was damaged in the 1692 earthquake, and by the 1770s many older buildings were being used by the townspeople. A farmhouse was built into the ruins of St Pancras. In 1791, the south-eastern section of the abbey was sold off for a gaol and hospital, while the rest slowly crumbled away.